Fresh off talks of Bushwick's gentrification and ice cream, let's dive into something equally as sweet: chocolate. In the heart of Morgantown lies a factory where chocolate is imagined, packaged and then devoured with smiles of pure bliss. We visited Fine & Raw where Daniel Sklaar, a chocolatier and the owner of this buzzing locale, took me on a tour to see the inner workings of his delectable factory. The secret to Fine & Raw's outstanding flavors and melt-in-your-mouth textures is in the heat. Upon entry, you'll pass 150 pound burlap sacks filled with cacao beans from places like Bolivia, Colombia, Ghana and Madagascar. The beans go through a work-intensive process, produced on site, which includes sorting, searing, grinding, dehydrating, liquifying and packaging. But it's not that simple. I learned that to make one batch of chocolate, the process typically takes four days, and that's just for one flavor! Each step is crucial, but it's worth the wait. Daniel fell in love with the chocolate creative process, saying that "chocolate is all about chemistry." Finding a space in Bushwick to pursue his dreams was happenstance. After living in Williamsburg for 10 years, he considered turning his apartment into a factory. But a change of plans (lucky for us!) brought him to Bushwick, where seeing the space was "love at first sight." Daniel said, "I could see it." Fine & Raw was built during the better part of 2012 and opened in December of that year. With three full-time and three part-time employees, they are rapidly growing. 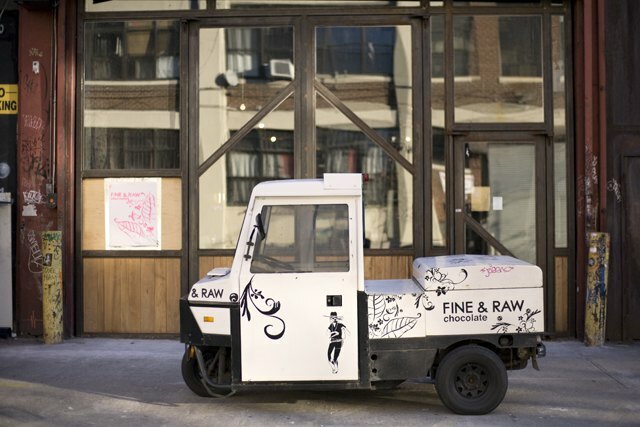 Fine & Raw distributes to select Whole Foods in NYC and NJ, Brooklyn Flea, various boutique hotels and cheese shops, and Dean & DeLuca. They also have distributors and sellers in Japan, Sydney and Johannesburg. Claiming that "Bushwick is a separate beast" than Williamsburg, Daniel is "positively psyched to be in this community." When he's not managing the factory, he experiments with smaller batches of chocolate on location, playing with flavors and pushing boundaries of what people expect from a bar of chocolate. "Chunkies" (AKA truffles) are Fine & Raw's signature product. When I asked Daniel if he had any favorites, he said that it depends on his mood, but his go-to is the Almond Chunky. Sea Salt is their biggest seller. Daniel recommends pairing his confections with red wine, or even beer, suggesting the raspberry bar with a glass of Malbec. I got to try the Lucuma and Vanilla - a toasted marshmallow and campfire explosion in one bite. It is superb. During the "chocolate season" (Christmas - Easter), Fine & Raw even sold a limited edition truffle chunky flavored with scotch. Yum! Stop by for some chocolate and an espresso, and take a break on the plush blood orange couch where you can watch the process yourself. Products range from $7 - $25. For a bit more money, you can go the gift box route and experience more flavors at your leisure. Fine & Raw delicacies are wrapped in gold foil - a Willy Wonka/golden ticket fantasy. Keep in the chocolate-know by liking Fine & Raw's Facebook page, and stay tuned for events at the factory that may turn up during Bushwick Open Studios. "Made in a chocolate lab where people eat a lot of chocolate and believe in sustainable design for your tongue. For the eco-chic & forward and any one whose tongue is bored and heart plays loud music that no one else can hear." Want more? Watch this interview with Daniel Sklaar!